As another year comes to a close, it is time to review how the macro consensus forecasts for 2018 that were made a year ago fared. Each December, I compile consensus economic and financial market forecasts for the year ahead. When the year comes to a close, I take a look back at the forecasts and compare them with what we now know actually occurred. I do this because markets generally do a good job of pricing in consensus views, but then move -- sometimes dramatically -- when a different outcomes transpire. When we look back, with 20/20 hindsight, we can see what the macro surprises were and interpret the market movements the surprises generated. It's not only interesting to look back at the notable global macro misses and the biggest forecast errors of the past year, it also helps us to understand the macro drivers of 2018 investment returns and to assess whether they are sustainable. In 2018, forecasters accurately forecast global real GDP growth. Weighted average real GDP growth for the twelve countries we monitor is now expected to be 3.7%, exactly matching the consensus forecast of 3.7% made a year ago. While the global growth forecast was bang on, the individual country GDP forecasts were not. In the twelve economies, real GDP growth exceeded forecasters' expectations in just three and fell short of expectations in nine. 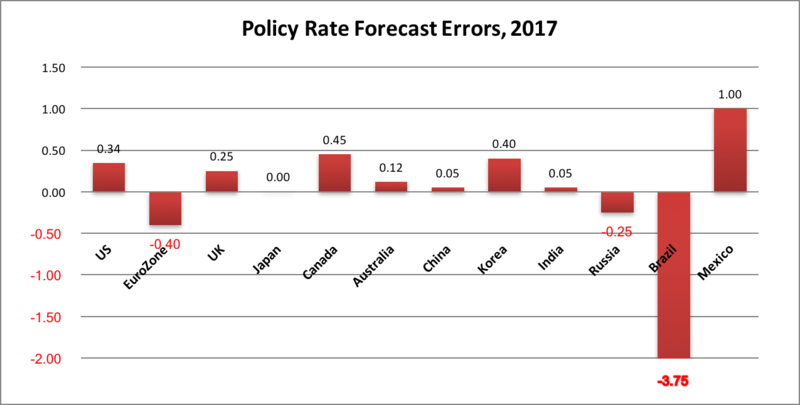 The weighted mean absolute forecast error for the twelve countries was 0.4 percentage points, about the same as the 2017 error. Based on current estimates, 2018 real GDP growth for the US exceeded the December 2017 consensus forecast by 0.5 percentage points (pct pts). Growth also slightly exceeded consensus expectations in Australia and China. The biggest downside misses on growth for 2018 were for Brazil (-1.5 pct pts), Japan (-0.7), Russia (-0.6), the Eurozone (-0.3), and India (-0.3). On balance, a big upside miss on US growth was offset by downside misses in other economies. Just as for global growth, the consensus forecast for global inflation for 2018 was very accurate. Average inflation for the twelve countries is now expected to be 2.4% compared with a consensus forecast of 2.4%. And just as for growth, upside misses just offset downside misses. Six of the twelve economies are on track for higher inflation than forecast, while inflation was lower than expected in six countries. The weighted mean absolute forecast error for 2018 for the 12 countries was 0.4 percentage points, down from a 0.6% average miss last year. The biggest downside misses on inflation were in India (-1.9 pct pts), and the UK (-0.3). The biggest upside miss on inflation were in Mexico (+1.1 pct pts) and the Eurozone (+0.6%). In 2018, economists' forecasts of central bank policy rates were, on balance, slightly too high. Four central banks hiked their policy rate by more than expected while six central banks hiked less than expected. In the DM, the Fed hiked the Fed Funds rate four times, one more than the consensus expected. The ECB and the BoJ met expectations by leaving their policy rates unchanged. The Bank of Canada and the Bank of England hiked slightly less than the consensus expectation. The Reserve Bank of Australia remained on hold instead of hiking once as the consensus expected. In the EM, as usual, the picture was more mixed. Brazil's central bank was able to cut its policy rate more than expected. Russia was expected to cut its policy rate but was unable to do so. In China, the PBoC stayed on hold, as expected, but did cut reserve requirements as the economy struggled to meet the government's growth target. India's RBI was expected to remain on hold in 2018, but had to raise its' policy rate. Mexico extended the trend of late 2016-17, tightening more than expected as inflation rose in response to the weakening of the Mexican Peso. In nine of the twelve economies, 10-year bond yield forecasts made one year ago were too high. In all six DM economies that we track, 10-year bond yields surprised strategists to the downside. The weighted average DM forecast error was -0.30 percentage points, the same as for 2017. The biggest misses were in Australia (-0.74 pct pts), Canada (-0.57), the Eurozone (proxied by Germany, -0.55), the UK (-0.35 pct. pt.). In the EM, the picture was mixed as bond yields were lower than forecast in Brazil (-1.78 pct pts) and Korea (-0.75). However, bond yields rose more than expected in Russia (+1.91), Mexico (+1.20) and India (0.36). All of the major currencies were weaker than expected against the US dollar. The weighted mean absolute forecast error for the 11 currencies versus the USD was 7.5%. The USD was expected to strengthen following the election of Donald Trump as President. In 2017, however, USD unexpectedly weakened reflecting early delays in implementation of Trump's promised tax cuts, hesitation to tighten by the Fed, unexpected tightening by some other central banks and ebbing political uncertainties in emerging economies. In 2018, as Trump's tax cuts took effect, the Fed hiked four times and shrank its' balance sheet, and Trump began his strategy of raising tariffs to pressure trading partners into more advantageous trade arrangements, the USD outperformed all expectations. The biggest FX forecast misses for the DM economies were for the Canadian Dollar (which was 11.4% weaker than expected), the UK Pound (-9.3%), the Australian Dollar (-8.5%) and the Euro (-8.0%). EM currencies also weakened sharply against USD, led by the Russian Ruble (-17.2%), Brazilian Real (-15.5%) and Indian Rupee (-6.7%). 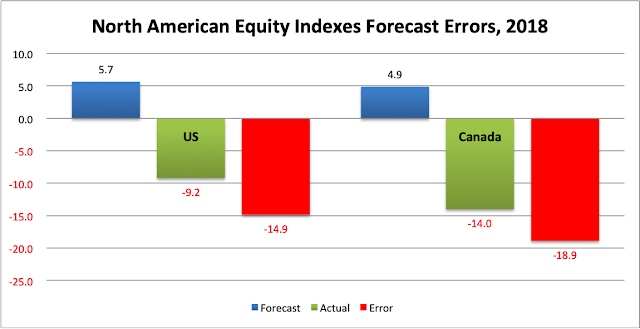 News outlets gather equity market forecasts from high profile US strategists and Canadian bank-owned dealers. A year ago, equity strategists were optimistic that North American stock markets would turn in a modest, if unspectacular, positive performance in 2018. This call was far off the mark. As shown below, those forecasts called for 2018 gains of 5.7% for the S&P500 and 4.9% for the S&PTSX Composite. As of December 21, 2018, the S&P500, was down 9.2% year-to-date (not including dividends) for an error of -14.9 percentage points. The S&PTSX300 was down 14.0% for an error of -18.9 percentage points. Although global real GDP growth, global inflation and major central bank actions were close to consensus forecasts, the divergences from consensus expectations across countries proved a toxic mix for equities. Stronger than expected US growth and a slight uptick of inflation were met with a slightly quicker normalization of the US policy rate and a steady reduction in the size of the Fed's balance sheet. As the Fed persisted with plans to continue tightening amid slowing growth in Europe, Japan and Emerging Markets, equity markets fell like dominoes. Declines began in EM, spread to Europe and Japan, and finally reached US equity markets in the final two months of 2018. Globally, stock market performance (in local currency terms) was horrible. The Eurozone and Canada led declines in DM equity markets. China, Korea and Mexico led decliners in EM markets. Brazil and India, bucking the global trend, posted gains. In 2018 global macro forecast misses were once again quite different from those of recent years. The accuracy of global growth and inflation forecasts masked unexpected divergences in growth and inflation from expectations for individual countries. Stronger than expected US growth, faster than expected Fed tightening and Trump's tariff increases saw the USD strengthen against all of the major currencies. This mix was particularly difficult for EM economies, including China, with large amounts of USD-denominated debt. As EM economies slowed, crude oil and other commodity prices fell sharply, dimming prospects for countries like Canada and Australia. Stronger than expected growth had US stocks outperforming bonds for most of the year. Market concerns that the Fed would continue tightening even as growth outside the US was faltering contributed to the sharp fall in global equity prices in 4Q18. By year end, both US equity and bond prices had fallen, but bonds outperformed as risk aversion took hold. For Canadian investors, the depreciation of CAD against the USD meant that returns (in CAD terms) on government bonds denominated in US dollars were boosted if the USD currency exposure was left unhedged. The only slight positive returns for Canadian investors came in Canadian and unhedged foreign bonds. 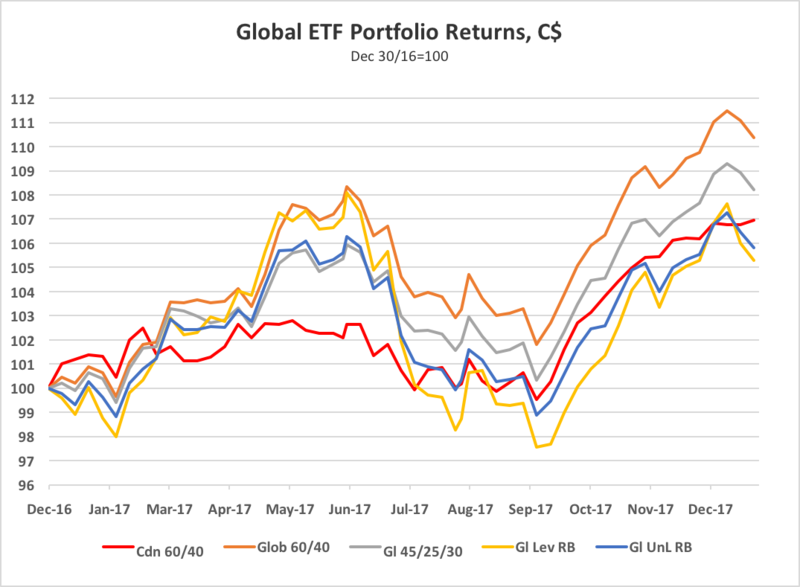 The outperformance of globally diversified portfolios over stay-at-home Canadian portfolios continued in 2018. As 2019 economic and financial market forecasts are rolled out, it is worth reflecting that, for a variety of reasons, such forecasts have been a poor guide to investment decisions for several years running. 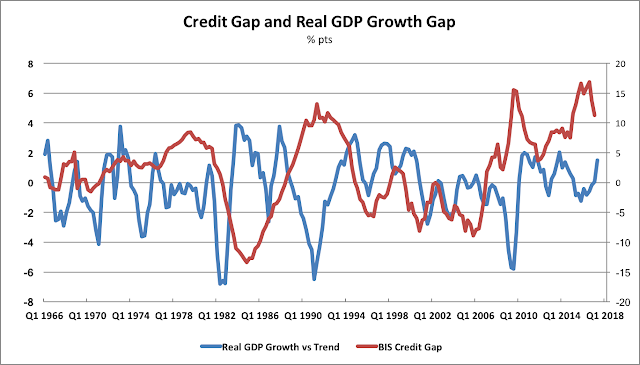 While forecasters' optimism about global growth remains in place, cracks are now forming. 2019 will undoubtedly once again see some large consensus forecast misses, as new surprises arise. The 2017 macro surprises, higher than expected growth and lower than expected inflation, are now being built in to 2018 views. This actually increases the chances of disappointments that are negative for equities and other risk assets. Although it took until late in the year, those disappointments did arrive in 2018. This has left the global economy and financial markets in an uncertain and somewhat precarious position heading into 2019. With central banks focussed on "normalizing" monetary policy, the buoyant financial market performance that accompanied massive expansion of central bank balance sheets is increasingly looking like it's going into reverse. The Bank of Canada hiked it's policy rate by 25 basis points to 1.5% on July 11, in a move that was widely anticipated by the consensus. All but one of the nine MPC members who attended this meeting called for an overnight rate target higher than the current one at the upcoming meeting on Wednesday 11 July. The near unanimity reflected the group’s view that Canadian economic data in the second quarter have rebounded from a sluggish beginning to 2018. Output has risen since April, with the Business Outlook Survey suggesting we are at or above productive capacity. The labour market is also showing signs of tightening with growth in average hourly earnings at its highest level since 2008. This is the conventional wisdom which nearly everyone with an educated opinion accepts. It is based on the notion that the economy has reached or exceeded its' full capacity. The unemployment rate, which ticked up last month, had previously fallen to its lowest since comparable data became available in 1976. Wage growth, as measured by average hourly earnings of permanent employees reached 3.9% in May, the highest since 2008. The Canadian economy is in an interesting position approaching the middle of 2018. Growth has slowed in recent quarters, after a very strong 2017H1. There are convincing signs, however, that this slowing reflects the economy hitting capacity constraints, rather than a sudden fall off in demand. Consistent with this, genuine inflation pressures have become more evident. Canada is the only G7 country to experience a significant acceleration in wage inflation as the unemployment rate has fallen below traditional estimates of NAIRU.All these factors suggest that the Bank of Canada is behind the curve on its policy of rate normalization. The Bank of Canada should play catch up in "normalizing" it's policy rate. I believe that neither of the first two points is an accurate description of the current situation in Canada and therefore, that the conclusion about Bank of Canada policy does not follow. Why is Canada facing capacity pressures? I don’t share the view that growth has slowed because of capacity constraints that have pushed up wages. I believe the latest acceleration in wages in a slowing economy was driven by sharp increases in minimum wages in several provinces, which began in 2017. Across Canada's ten provinces, the minimum wage rose by a weighted average 4.1% in 2017 (led by an 11.5% hike in Alberta) and by 11.0% in 2018 (led by a 20.7% hike in Ontario). Minimum wage hikes, not excess labour demand, have forced employers to raise wages not only for minimum wage employees, but also for employees who had moved to above-minimum-wage status, to maintain some equity and premium for experience. With 15% of employees affected directly or indirectly, these minimum wage hikes are sufficient to explain the majority of the acceleration average hourly wages for the total workforce. The sharp increase in early 2018 is probably also partly responsible for employment having declined 50,000 in the first five months of 2018. I would characterize capacity utilization reaching cyclical highs even as growth has slowed as being caused by insufficient business non-residential investment. 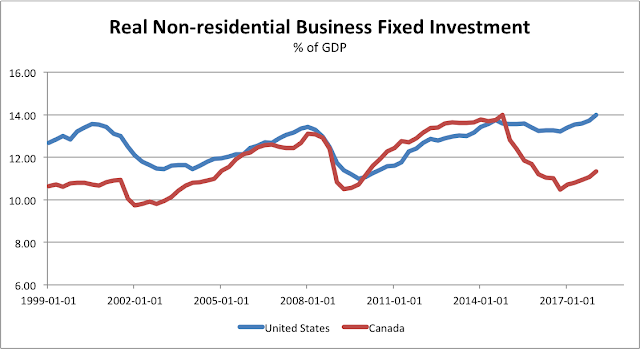 The chart below compares Canada and US real nonresidential business investment to GDP. 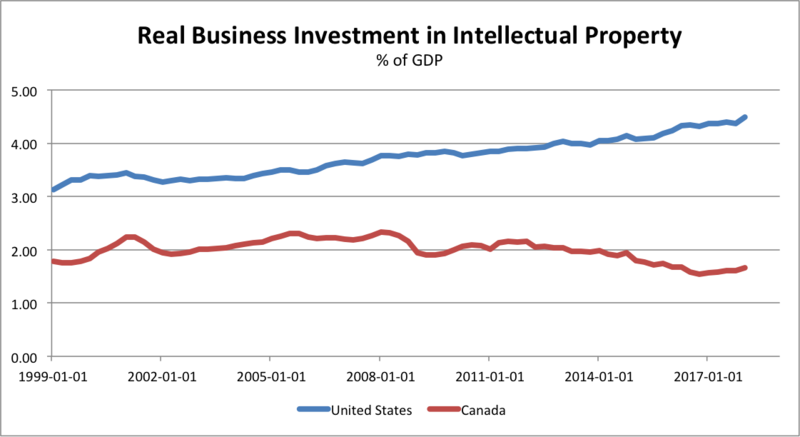 Over the past two decades, Canada has lagged the United States in business investment in plant, equipment and intellectual property. Canada's real investment rose as a percentage of GDP in the periods leading into 2008 and into 2014 when global crude oil prices were strong, boosting investment in Canada's oil and gas industry, led by growth of oil-sands production. Since the collapse of crude oil prices in 2014, followed by aggressive new government regulations and taxes in pursuit of climate change objectives, Canadian business investment fell to recessionary levels in 2016-17. While US business investment as a percentage of GDP has risen to a 20-year high, Canada's investment has fallen toward two decade lows. The mix of Canada's business investment also demonstrates weakness. The charts below show Canada-U.S. comparisons of business spending on machinery and equipment, nonresidential structures and intellectual property. US spending on machinery and equipment reached 6.5% of GDP in 1Q18, its' highest level in over 20 years. Meanwhile, Canada's spending on M&E was one-third lower at just 4.1% of GDP, still below the level reached prior to the Great Financial Crisis. US business spending on intellectual property has been rising strongly and reached 4.5% of GDP in 1Q18. This was well over double Canada's spending of just 1.8% of GDP. Canada's business spending on non-residential structures rose to 5.5% of GDP in 1Q18, well below the peak level of 7.5% reached in 2Q14. The decline in crude oil prices slowed energy investment after 2014 and increased regulation stalled investment in pipeline building. 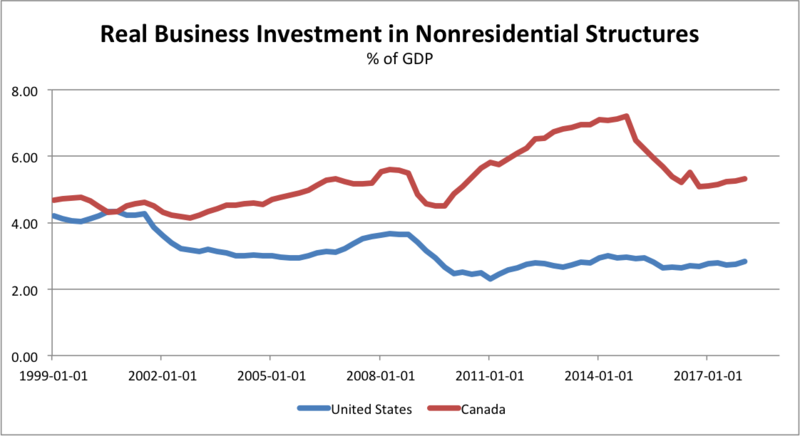 Canada still devotes almost double the US investment to nonresidential structures. Canada's mix of business investment, which has been heavily skewed toward energy investment is a disadvantage when crude oil prices are weak and when governments prioritize environmental concerns. 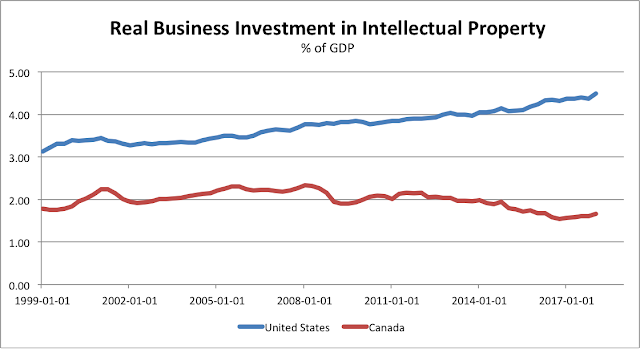 Canada has badly lagged the United States for decades in investment in machinery and equipment and intellectual property, but in both cases the US is opening up a widening gap. What's Behind Canada's Weak Business Investment? 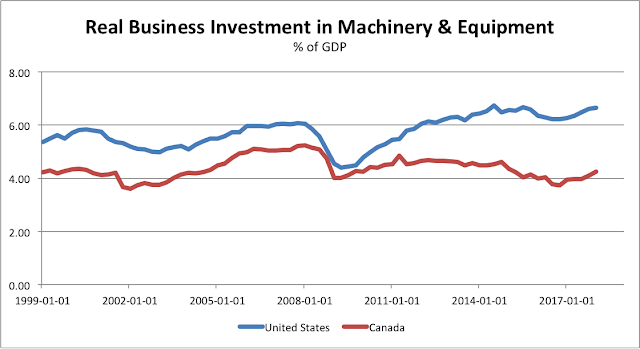 To some extent, Canada's lagging business investment is the result of differences in the industrial structure of the two countries. Canada has abundant natural resources and has long been a leader in capital investment in the extraction and transportation of these resources. When natural resource prices weaken or when governments adopt taxes and regulations that discourage resource development Canada's business investment can weaken quite dramatically. The United States has long been a leader in high technology industries and in the implementation of new technologies to increase business productivity and efficiency. As the pace of technological development accelerates, the US seems to be widening and deepening its advantage in business investment in both machinery and equipment and intellectual property. While industrial structure is important, the influence of government policies can also be very important. Some recent policy developments in the US and Canada clearly seem to have tilted incentives toward higher investment in the US and weaker investment in Canada. Corporate Tax: The Trump Administration has lowered corporate tax rates and encouraged repatriation of foreign profits. Canada has, so far, left its corporate tax rates unchanged. In 2017, the federal government raised the ire of small business by suggesting that they were not paying their "fair share" or taxes, before backing down on proposed changes. Carbon Tax: The Government of Canada introduced a carbon tax of C$10 per tonne in 2018, rising to C$50 per tonne by 2022. The Trump Administration has pulled out of the Paris Climate Accord and the President has tweeted "I will not support or endorse a carbon tax!" Regulation: President Trump has instructed the Environmental Protection Agency to cut regulations on industry and speed up decisions on permits. In Canada, environmental regulations have been tightened and the process to gain approval for pipelines and other energy projects has been made more complicated and time-consuming (see here). threatened 25% tariffs on all auto imports, using the same "national security" justification. Trump’s tax and regulatory moves and the uncertainty generated by his trade policies have discouraged business investment in key Canadian goods producing industries. Meanwhile Trudeau’s attempts to tighten small business tax rules and the introduction of new regulatory obstacles to pipeline building and other energy projects have curtailed Canada’s future ability to get oil to export markets, depressed prices of Canadian crude and discouraged investment. The net result has been to tilt incentives to invest away from Canada and in favour of the United States. The comparative charts shown above of US and Canadian business investment-to-GDP provide strong evidence that this is the case. 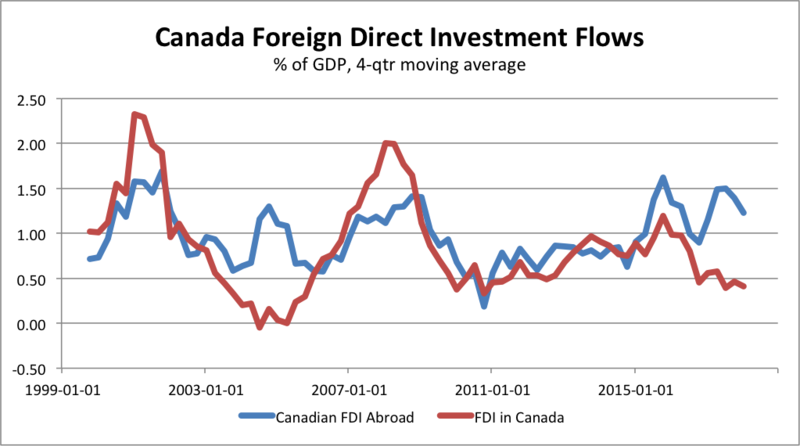 Further supporting evidence is provided by the chart below, which shows Canada's foreign direct investment flows. The chart clearly shows that while Canadian direct investment abroad is near its' 20-year highs, foreign direct investment flows into Canada have fallen toward 20-year lows. US, Canadian and other foreign companies have a choice as to which side of the border to invest. They are increasingly choosing to invest in the US. The attraction of lower corporate taxes and reduced regulation combined with punitive US tariffs and uncertainty over the future of NAFTA provide powerful incentives to make capacity-expanding investment in the US, not in Canada. So far, Canada has not responded effectively to Trump's tax and regulatory moves. On corporate taxes, the 2018 Federal Budget provided neither action nor a plan to revise Canada's corporate income tax, which prior to Trump's changes, had been relatively attractive. The federal government has not budged on its' plan to enforce a Canada-wide carbon tax, but provincial governments in Saskatchewan and Ontario oppose the plan and a change of government in Alberta would add a third important opponent, making it difficult for the federal government to implement its' carbon tax plan. Uncertainty over the future of carbon taxes remains a negative for business investment. On regulatory measures, the Trudeau government, after allowing a dysfunctional regulatory process to cause the Northern Gateway Pipeline and the Energy East Pipeline projects to die, approved the Trans-Mountain Pipeline. However, because of protests by the Government of British Columbia, environmental activists and indigenous groups, the private investor, Kinder Morgan, shelved the project. The Federal Government kept the project on life support by purchasing the Trans Mountain Pipeline from Kinder Morgan for C$4.5 billion and promising to build it. Opponents will still make strong efforts to block the project, leaving Canada with insufficient capacity to get its' oil to world markets. On trade policy, the federal government has chosen to retaliate against Trump's steel and aluminum tariffs with and equal value of tariffs on a range of US imports, a move which could provoke Trump into further escalating the trade war. Trump has shot Canada in one foot with his tariffs and duties on lumber, steel and aluminum and his threats of tearing up NAFTA and imposing tariffs on autos. Trudeau has shot Canada in its' other foot by imposing tariffs on US goods consumed by Canadians and his rhetoric that Canada "will not be bullied", which has contributed to the standstill in NAFTA negotiations. Let's be clear: Trump's trade policies and threats are dangerous and, if carried out, pose a clear risk to the global growth. But retaliation by US trading partners only increases that risk. Is Canada Operating at Full Capacity? It seems clear to me that Canada's economy is suffering from an investment drought. While unemployment is low by historical standards, weak business investment is resulting in many Canadians working at jobs well below their potential. Self employment is at a record level. Young people have great difficulty finding jobs that match their education and qualifications. Higher levels of business investment would surely create more full time private sector employment and stronger GDP growth. Traditional measures may suggest that Canada is near full capacity, but in my view, it is nowhere near full potential. I am hopeful, however, that the next few years will see Canadian voters electing governments more attuned to the necessity of building a positive investment climate. Change is already underway in Ontario and is pending in Alberta. Only when federal and provincial governments begin working together on a comprehensive strategy to improve the climate for business investment will Canada reach its' potential. In the meantime, tightening monetary policy is unlikely to improve Canada's economic prospects. Bank of Canada tightening in response to politically motivated spikes in minimum wages or to temporary upward pressure on Canadian inflation from US and Canadian tariff hikes is clearly inappropriate. 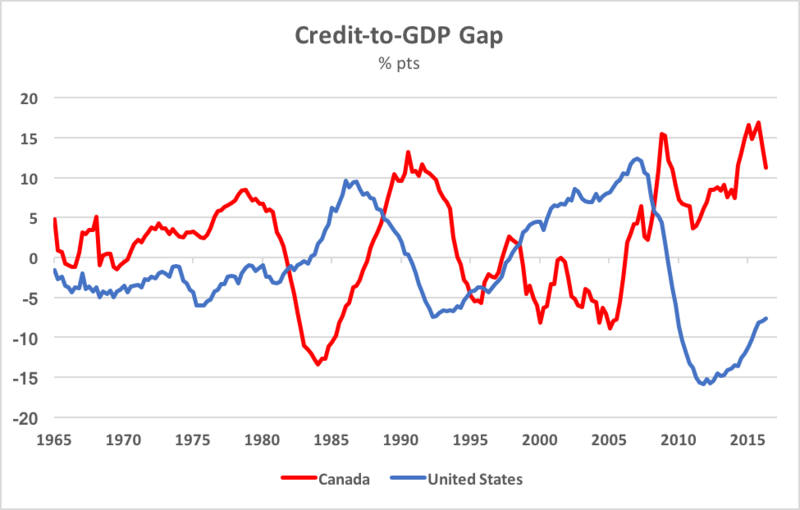 Until Canada is able to bring about a lasting improvement in its' investment climate, a Bank of Canada monetary policy strategy of standing pat while the US Fed tightens monetary policy more aggressively would tend to weaken the Canadian dollar, thereby providing a boost to our export competitiveness and a needed adjustment cushion the blow from US protectionism. As the year comes to a close, it is time to review how the macro consensus forecasts for 2017 that were made a year ago fared. Each December, I compile consensus economic and financial market forecasts for the year ahead. When the year comes to a close, I take a look back at the forecasts and compare them with what we now know actually occurred. I do this because markets generally do a good job of pricing in consensus views, but then move -- sometimes dramatically -- when a different outcome transpires. When we look back, with 20/20 hindsight, we can see what the surprises were and interpret the market movements the surprises generated. 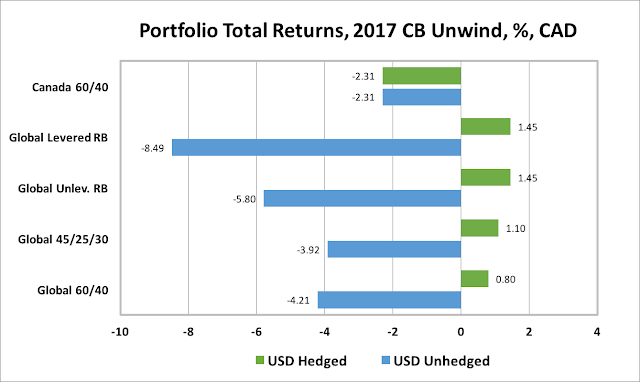 It's not only interesting to look back at the notable global macro misses and the biggest forecast errors of the past year, it also helps us to understand 2017 investment returns and to assess whether they are sustainable. In 2017, for the first time in years, forecasters underestimated global real GDP growth. Average real GDP growth for the twelve countries we monitor is now expected to be 3.6% compared with a consensus forecast of 3.3%. In the twelve economies, real GDP growth exceeded forecasters' expectations in nine and fell short of expectations in just two. The weighted mean absolute forecast error for 2016 was 0.43 percentage points, down slightly from the 2016 error. Based on current estimates, 2017 real GDP growth for the US exceeded the December 2016 consensus by 0.2 percentage points compared with a 0.8 downside miss in 2016. The biggest upside misses for 2017 were for Canada (+1.2 pct pts), Eurozone (+0.9), Korea (+0.9), China (+0.4) and Japan (+0.4). India's real GDP undershot forecasts by 0.6 pct pts and Australia by 0.4. On balance, it was the first year in seven that global growth exceeded consensus expectations. Inflation forecasts for 2017 were, once again, too high. Average inflation for the twelve countries is now expected to be 2.2% compared with a consensus forecast of 2.5%. Eight of the twelve economies are on track for lower inflation than forecast, while inflation was higher than expected in three countries. The weighted mean absolute forecast error for 2016 for the 12 countries was 0.58 percentage points, a much larger average miss than last year. The biggest downside misses on inflation were in Russia (-2.4 pct pts), Brazil (-1.1), China (-0.7), and Canada (-0.6). The biggest upside miss on inflation was in Mexico (+2.7 pct pts). In 2017, for the first time in many years, economists' forecasts of central bank policy rates were too low. In the DM, the Fed hiked the Fed Funds rate three times, more than the consensus expected. The ECB had been expected to keep its Refi rate unchanged, but surprised forecasters by lowering it to -0.4%. The Bank of Canada and the Bank of England had been expected to leave rates unchanged in 2017, but the BoC unexpectedly hiked twice and the BoE hiked once. In Australia, the consensus leaned toward a rate cut in 2017, but the RBA stayed on hold. The Bank of Japan met expectations and stayed on hold at -0.1%. In the EM, the picture was more mixed. Brazil's central bank was able to cut its policy rate much more than expected as inflation eased, while Russia was also able to cut its policy rate a bit more than expected. In China, the PBoC stayed on hold, as expected, while India's RBI eased 25bps, also in line with expectations. Mexico extended the trend of late 2016, tightening 100 bps more than expected as inflation rose sharply in delayed response to the weakening of the Mexican Peso as NAFTA came under heavy fire from the Trump Administration. 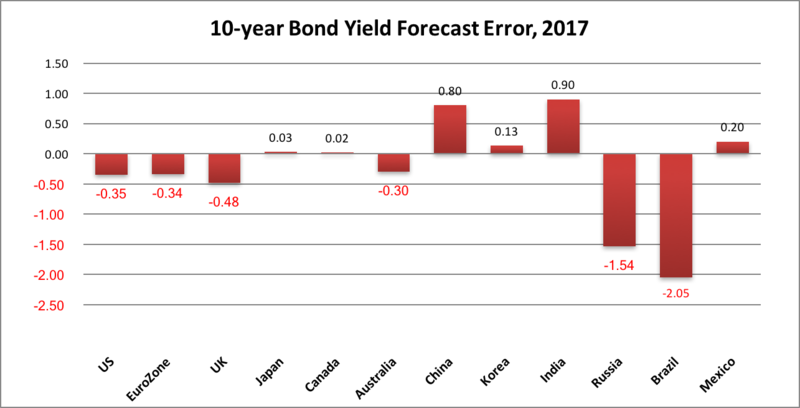 In six of the twelve economies, 10-year bond yield forecasts made one year ago were too high. Weaker than expected inflation combined with aggressive bond buying by the the ECB pulled 10-year yields down in most DM countries compared with forecasts of rising yields made a year ago. In four of the six DM economies that we track, 10-year bond yields surprised strategists to the downside. The weighted average DM forecast error was -0.30 percentage points. The biggest misses were in the UK (-0.48 pct. pt. ), US (-0.35), Eurozone (proxied by Germany, -0.34) and Australia (-0.30). In the EM, the picture was mixed as bond yields were lower than forecast where inflation fell more than expected, in Brazil (-2.05 pct pts) and Russia (-1.54). Bond yields were higher than expected in China, India and Mexico. All of the major currencies (with the exception if the UK sterling) were stronger than expected against the US dollar. The weighted mean absolute forecast error for the 11 currencies versus the USD was 7.7% versus the forecast made a year ago, a larger error than last year. The USD was expected to strengthen following the election of Donald Trump as President. Trump's criticism of the Fed during the 2016 election (implying that Fed Chair Janet Yellen would not be reappointed) and his plans for deregulation and fiscal stimulus had most forecasters expecting the USD to hold steady or strengthen against most currencies. As it turned out, delays in implementation of Trump's promises, hesitation by the Fed, unexpected tightening by some other central banks and ebbing political uncertainties in emerging countries saw the USD weaken against all currencies with the exception of Sterling, which struggled under the weight of Brexit uncertainty. The biggest FX forecast misses were for the Euro (which was 10.8% stronger than expected), Russian Ruble (+10.1%) and Korean Won (+11.0%). The Canadian Dollar (+7.7%) and the Mexican Peso (+6.4%) were stronger than expected, despite NAFTA worries, as the central banks of both countries tightened more than forecasters had expected. China, India and Brazil also saw greater than expected currency strength. 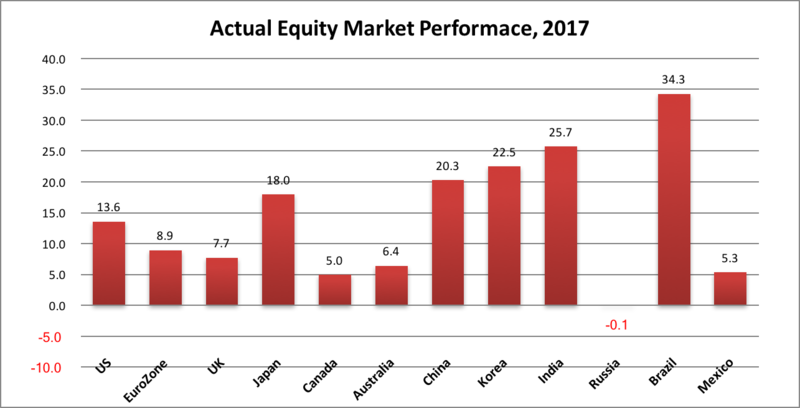 A year ago, equity strategists were optimistic that North American stock markets would turn in a modest, unspectacular positive performance in 2017. News outlets gather forecasts from high profile US strategists and Canadian bank-owned dealers. As shown below, those forecasts called for 2017 gains of 6.0% for the S&P500 and 4.3% for the S&PTSX Composite. However, global real GDP growth surprised on the upside and global inflation surpassed on the downside, both misses being positive for equities. As of December 26, 2017, the S&P500, was up 19.9% year-to-date (not including dividends) for an error of +13.9 percentage points. The S&PTSX300 was up a more modest 5.8% for an error of +1.5 percentage points. Globally, stock market performance (in local currency terms) was impressive. Japan and most emerging markets (with the exception of Russia) posted the best gains. Canada and Mexico were laggards. In 2017 global macro forecast misses were quite different from those of recent years. Real GDP growth exceeded expectations for the first time in seven years. CPI inflation continued to surprise on the downside, but several major central banks tightened more than expected despite weak inflation. However, the impact of higher than expected policy rates on bond yields was more than offset by the ECB's move to a significantly negative policy rate combined with continued large scale bond purchases. Consequently, even though major central banks tightened more than expected, bond yields came in lower than expected. And even though the US Fed led the move to tighten, the USD was weaker than expected against all of the major currencies expect UK Sterling. Stronger than expected global growth, lower than expected inflation, and a smaller than expected rise in bond yields boosted equity performance in virtually all markets. US equities posted double-digit returns for a second consecutive year. The combination of better than expected real GDP growth and stimulative monetary policy boosted Japanese stocks and European stocks. Strong global growth and reduced political uncertainties facing Brazil and Russia helped lift Emerging Market equities to robust gains. In China, equity prices rebounded as Trump's protectionist campaign rhetoric against China was moderated by the US need for Chinese cooperation against North Korea's nuclear threat. Instead, Trump's protectionism was focussed on renegotiating NAFTA with Canada and Mexico, whose stock markets underperformed. For Canadian investors, the stronger than expected appreciation of CAD against the USD meant that returns on investments in both equities and government bonds denominated in US dollars were reduced if the USD currency exposure was left unhedged. The biggest winners for unhedged Canadian investors were Eurozone, Japanese and Emerging Market equities. 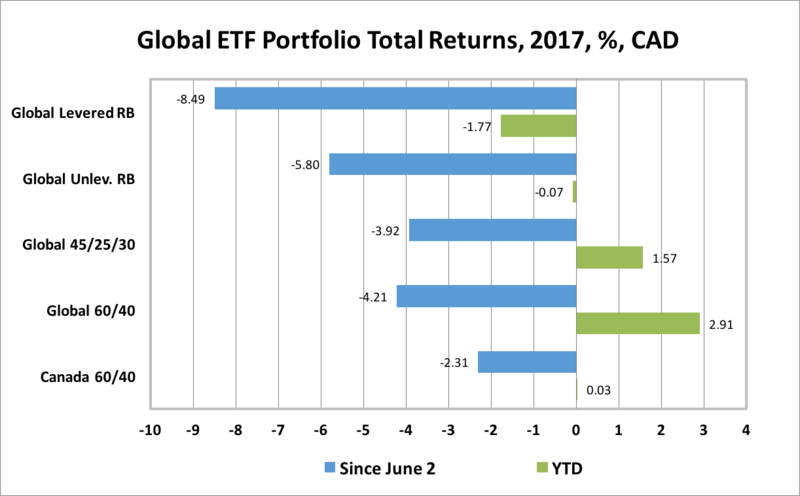 The outperformance globally diversified portfolios over stay-at-home Canadian portfolios reasserted itself in 2017. As 2018 economic and financial market forecasts are rolled out, it is worth reflecting that such forecasts form a very uncertain basis for year-ahead investment strategies. While forecasters' optimism about global growth appears high, 2018 will undoubtedly once again see some large consensus forecast misses, as new surprises arise. The 2017 surprises, higher than expected growth and lower than expected inflation are now being built in to 2018 views. This actually increases the chances of disappointments that are negative for equities and other risk assets. With unconventional monetary stimulus being questioned and central banks belatedly beginning to focus on containing debt growth rather than hitting inflation targets, the scope for unfriendly surprises is rising. The Great Unwind of extraordinarily accommodative global monetary policy got underway in earnest in June, 2017. Until then, though the Fed had begun reducing monetary ease at the end of 2015, other major central banks had maintained very easy policies. Then, as if on cue, the European Central Bank expressed confidence in the strength of Euro Area growth and mused about reducing its bond purchases (June 8); the Bank of Canada's top officials suddenly executed a U-turn from ruminations about cutting rates in January to contemplating early rate hikes (June 12-13); the Federal Reserve hiked its policy rate and discussed reducing its' $4.5 trillion balance sheet (June 14); and Bank of England Governor Mark Carney said the BoE may need to begin raising interest rates and would debate a move in the next few months (June 28). Increasing the likelihood that these central bank unwinding moves were coordinated was the Bank for International Settlements Annual Report, released on June 25, titled Monetary Policy: Inching Toward Normalization, which laid out the case for removing monetary stimulus even though inflation remains well below target in virtually all of the major advanced economies. The coordinated central bank (CB) unwinding of monetary stimulus has been widely applauded as a recognition that global growth has strengthened, global slack has diminished and global debt-to-GDP ratios had risen to all-time highs, posing financial stability risks. But despite the fact that unprecedented global monetary policy accommodation had fuelled asset price growth for years, few commentators raised concerns that unwinding monetary policy stimulus might have negative consequences for global asset prices. This post takes a brief look at how the Great Unwind has affected Canadian investors. I do this through the lens of the global ETF portfolios for Canadian investors that I regularly track in this blog. 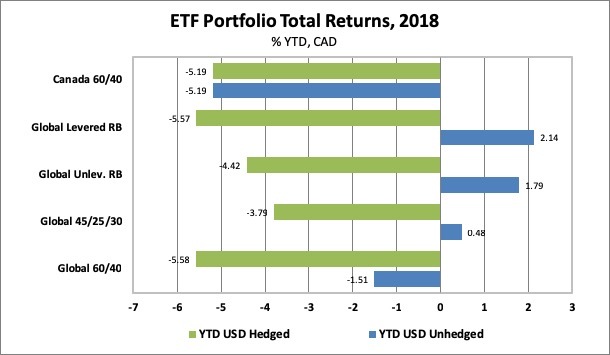 The chart below shows year-to-date total returns for these portfolios, in Canadian dollar (CAD) terms. 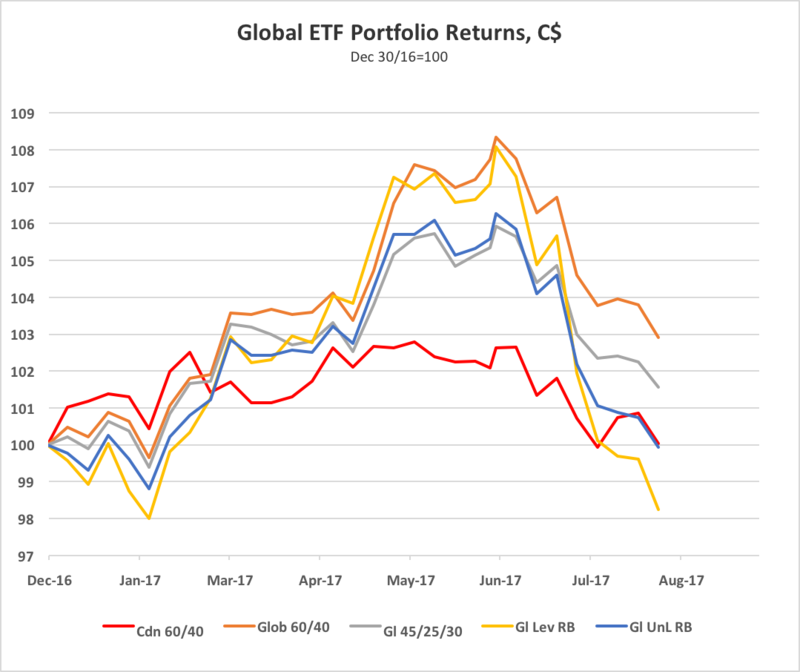 The chart shows returns for five portfolios: an all-Canadian ETF portfolio (Cdn 60/40) made up of 60% Canadian equities (XIU), 35% Canadian bonds (XBB) and 5% Canadian real return bonds (XRB); a Global 60/40 portfolio including both Canadian and global equity and bond ETFs; a more conservative Global 45/25/30 portfolio made up of 45% global equity ETFs, 25% global bond ETFs and 30% cash, a Global Levered Risk Balanced Portfolio (Gl Lev RB), which uses leverage to balance the expected risk contribution from the Global Market ETFs, and a Global Unlevered Risk Balanced Portfolio (Gl UnL RB), which has less exposure to government bond ETFs, inflation-linked bond ETFs and commodity ETFs than the levered risk balanced portfolio but more exposure to corporate credit ETFs. As is evident from the chart, all of these portfolios performed well into early June, peaking in the week ending June 2. After the ECB signalled its change of direction on June 8, all of the portfolios began to give back their gains. 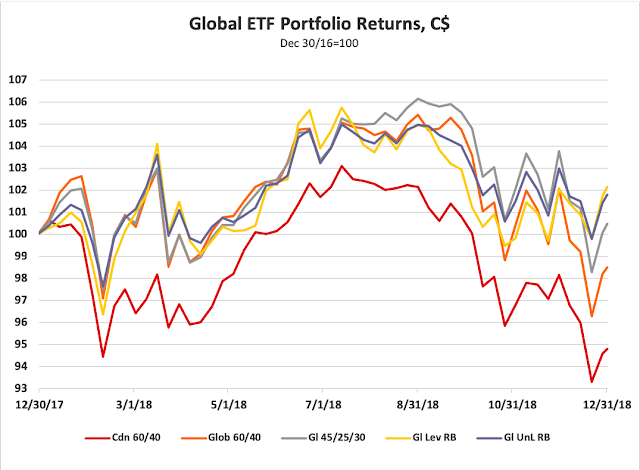 The Global 60/40 portfolio, which had the strongest year-to-date (ytd) gain of 8.2% on June 2, has given back about two-thirds of its gain and was up just 2.9% for the year by the week ended July 28. 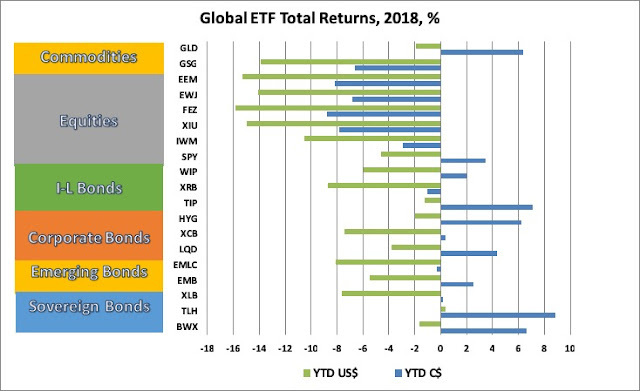 Hardest hit was the Global Risk Balanced Portfolio, which went from a ytd gain of 8.1% on June 2 to a ytd loss of 1.8% by July 28. The gain in the all-Canadian portfolio, which had struggled to a 2.9% ytd return by June 2, had been erased to a 0.1% loss by July 28. 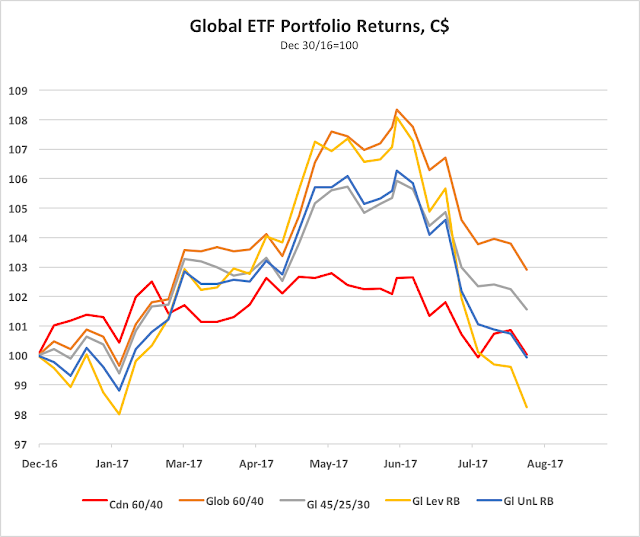 If the global and Canadian economies are faring so much better, why have investment returns for Canadian investors turned so negative in the Great Unwind? The answer is that the swift turnaround in the stance of the BoC caught markets by surprise and caused the Canadian dollar to surge against the US dollar and other currencies. 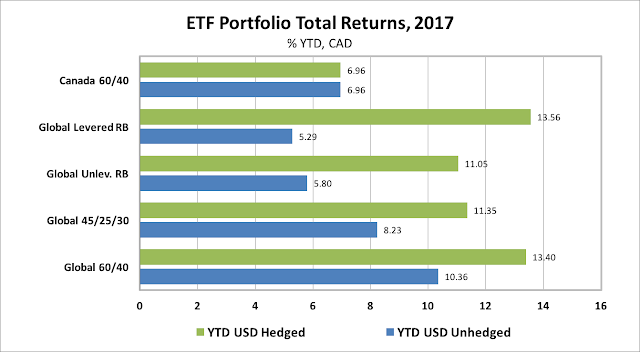 The surge in CAD has imposed losses on unhedged investors in global ETFs denominated in US dollars. As shown in the chart below, every ETF tracked in this blog has experienced negative returns in CAD terms since the CB Unwind began in early June. The more hawkish BoC stance has also seen Canadian interest rates back up, pushing Canadian bond prices down and causing losses on Canadian bond ETFs. Making matters worse, the Canadian equity ETF (XIU) has been one of the worst performers (in local currency terms) among global equity ETFs since the Great Unwind began, losing 2.4%. 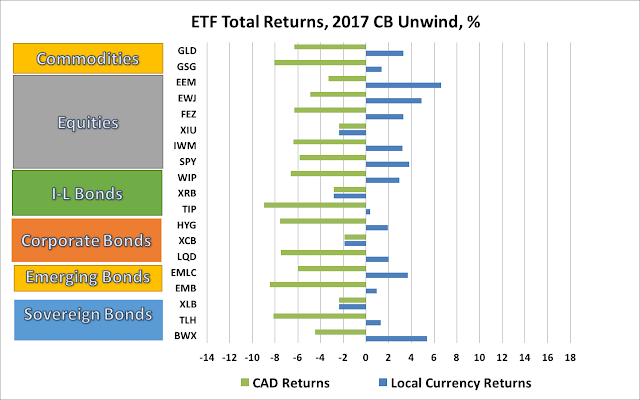 While US, Eurozone, Japanese, and Emerging Market ETFs have had better local currency returns, the surge in CAD has meant that these ETFs have experienced even bigger losses than XIU in Canadian dollar terms. Losses on global bond ETFs range from -4.5% to -9.0% in CAD terms since early June. Losses on global, equity ETFs range from -3.3% to -6.4%. Losses on gold and commodity ETFs range from -6.3% to -8.1%. 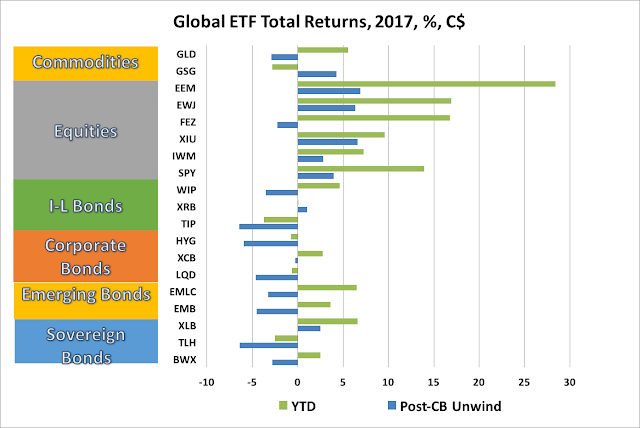 The result is that returns for Canadian investors on globally diversified portfolios have been hammered since the Great Unwind began, reducing or totally erasing the promising gains of the first five months of 2017 as shown in the chart below. There is a slight silver lining to the Great Unwind black cloud for Canadian investors. 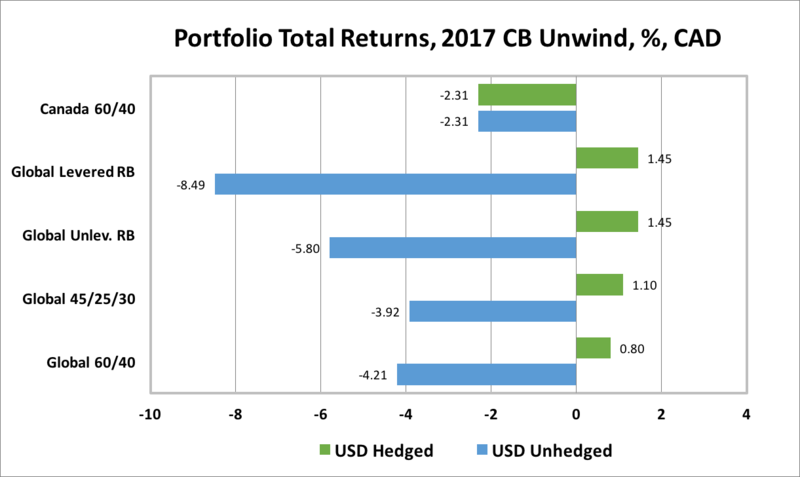 The chart below compares the Great unwind losses for currency unhedged portfolios with those portfolios that were USD-hegded. 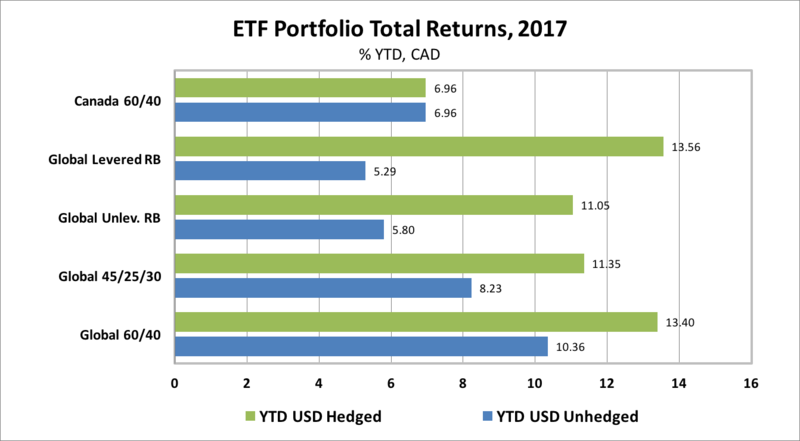 If foreign ETF holdings were USD-hedged, the globally diversified portfolios would have experienced small gains since June 2, much better performance than the all-Canadian portfolio. Unfortunately, most Canadian investors do not fully hedge their foreign currency exposures. Indeed, some large pension funds and the majority of individual investors do not hedge at all. My guess would be that far less than half of Canadians' holdings of C$1.8 trillion of foreign portfolio investments (of which $1.1 trillion are USD-denominated) are currency hedged. 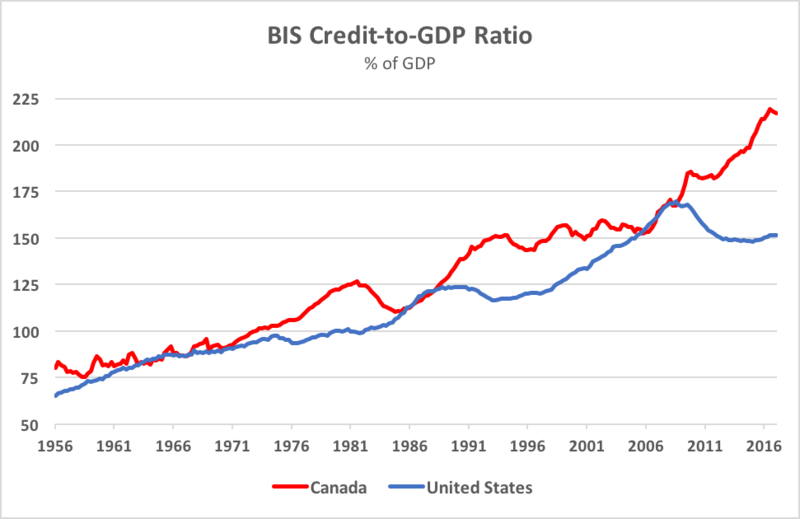 Based on this assumption, and on the holdings of Canadian bonds and equities, my back of the envelope estimate of the losses to Canadian investors since the beginning of the Great Unwind in early June would be in the neighbourhood of C$150 billion.